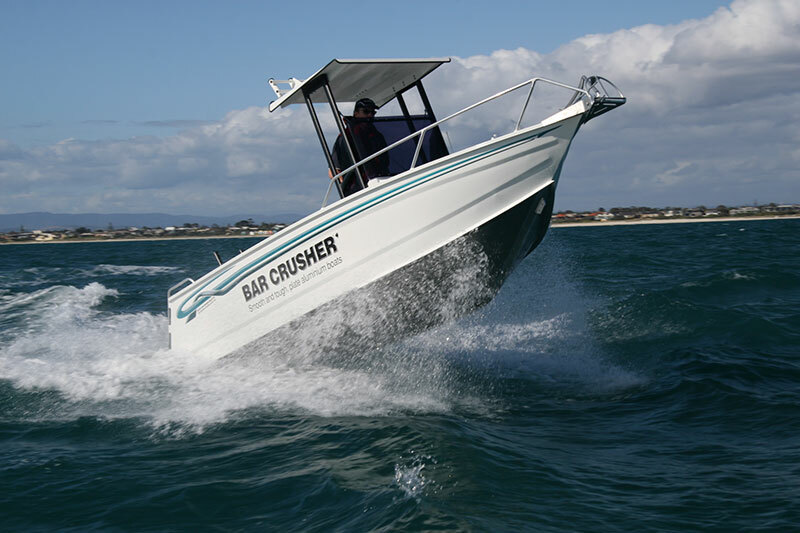 When the going gets tough, Bar Crusher’s new 530WR really gets going – eating up chop to deliver the smoothest ride of any boat in its class. A true estuary/offshore fishing all-rounder, the 530WR is constructed from heavy duty, pre-stressed 4mm (bottom sides) and 3mm (top sides) marine grade plate aluminium and boasts all of Bar Crusher’s exclusive features: high-tech Waveslicer™ non-pounding, deep-V hull; super-strong Rigideck™ sub-floor system; and Quickflow™ water ballast technology for superior stability at rest. With rods in the rocket launcher, gear stowed in the water-tight storage cavity beneath the forward deck, and food in the icebox under the padded bench seat, the comfortable helm position ensures good all-round vision while charging up river or navigating a bar crossing. The walk-around vessel’s self-draining checkerplate deck and functional cockpit depth ensure angler safety in all conditions, while rod holders, livebait tank, in-floor fish storage tank, berley bucket and large-volume storage pockets can be found among a long list of standard features. The rig’s pivoting aluminium hard-top also makes garage / carport storage a breeze. Rated to carry a 90-115hp outboard, combined with a 120lt fuel capacity, the 530WR goes the distance in more ways than one – thriving in conditions other aluminium boats flounder.